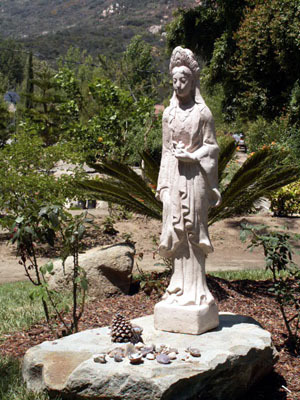 In early January of 2004, as I was preparing to move to China, I attended a very L.A. event. 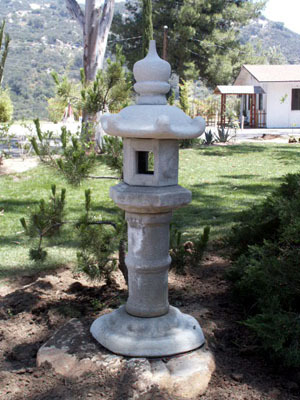 The Los Angeles County Museum of Art (LACMA) had sponsored an exhibition of Buddhist art called "The Circle of Bliss." 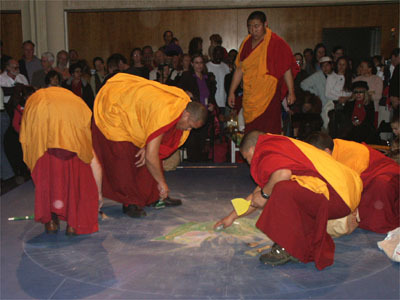 In association with that exhibition, they sponsored a group of Tibetan monks to create an 8-foot-across sand mandala. 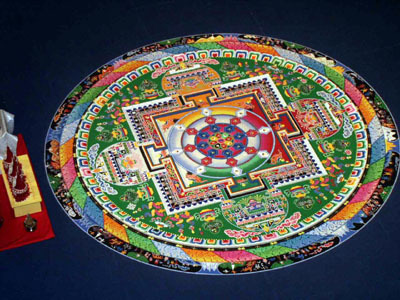 The outer edge of the mandala represents the world where we live. As one enters more deeply into the circle, one moves through various levels of symbolism, until at last one reaches the center, which represents the union of compassion and wisdom--in other words, Nirvana or "Bliss." The mandala was created in October, over a period of several weeks. 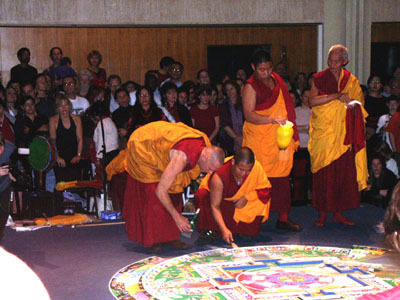 As a rule, such mandalas are created and then immediately destroyed, symbolizing impermanence. The creation of the mandala itself is a meditation, and the benefits to be had are in the making; the image itself is but a by-product. LACMA kept its mandala on display for over two months. The event that I attended that Sunday was the destruction and dispersal of the mandala. One of the things that strikes me about this whole process is the integrated thinking it represents. On one level, a bunch of guys in robes play in the sand, then destroy their creation, like boys at the beach building a sand castle and then bombarding it. But the participants--and the remarkably large crowd attending--see in this process a prayer, a blessing, a fulfillment of human potential. Even scoffers lined up to get their little box of sand. What this tells me is that metaphors are powerful, and the ability to see beyond the literal to the transcendent is a liberating power that frees us from the mundanity of our lives and opens us out to cosmic vistas. At Wilshire and Fairfax, next to the Tar Pits. When I worked in Tokyo, I had a counterpart in our Osaka office named Alex May. (Alex, if you Google yourself and find this, get in touch!) Anyway, because we had the same job, when he was busy, I was busy; when he was free, so was I. This allowed for long, leisurely e-mail conversations during work hours. Once, he pitched me a rare and wonderful idea. Our two cultures, he said (he was Australian, I from English-speaking North America) were the world's two "fake cultures." Well, he said, our cultures lie atop the land, without penetrating it. We have no sacred wells, no holy hills, no trees that are worshiped. He's right, and I really felt this in Japan, where the land has been so heavily sacralized. Before I ever "went East," I fell in love with the "non-Western" cultures of Mexico and the American Southwest. They have adopted Christianity--to a point. But just under the surface still lie the ancient beliefs. Frank Waters, a Southwest author, wrote of a tribe in northern Mexico that was usually resistant to Christianity, and how they oddly had embraced one particular church. There was an earthquake, and the altar tumbled over, and under it was found a squat stone idol. Thus, Waters concluded, when the Indians were bringing flowers and otherwise venerating that place, they were actually giving tribute to (I still remember his exact words) "the deep pool of unconscious that underlies all religion." 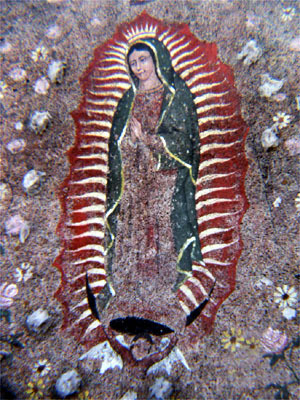 The popular image of the Virgin of Guadalupe, too, pays tribute to the ancient beliefs. Although ostensibly Mary, the Mother of God, in fact the image we see first appeared on a hill formerly occupied by the temple of the Aztec earth goddess Tonantzin. If you look carefully at the image, she is standing on a crescent moon, surrounded by the rays of the sun, in a robe decorated with stars. Who else could she be? She is venerated throughout the Americas (and even in the Philippines). 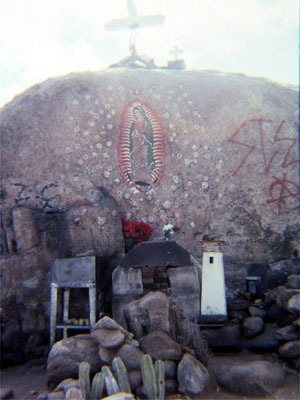 These images were shot at a roadside shrine in Baja California on a December, 1990, trip when I drove the length of the peninsula. Six years ago, my good friend Prince Roy and his wife and I took a "road trip" down to San Diego. 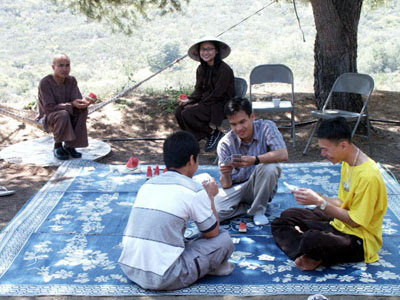 Another friend of mine had become "Thich Chan Phap Vu," a monk in the engaged Buddhism tradition of Thich Nhat Hanh. 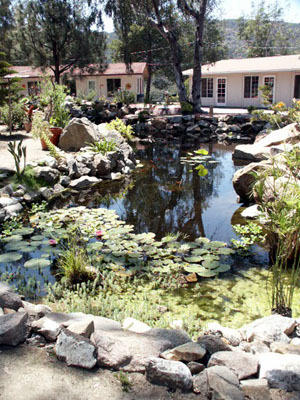 Chan Phap Vu was staying at Deer Park Monastery near Escondido before going to France to stay at the order's Plum Tree Village, where "Thay" (an affectionate name for Thich Nhat Hanh, meaning "master" or "teacher") has lived since he was exiled from his homeland in Vietnam. 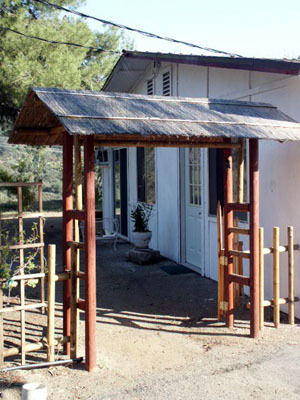 Before the monastery was located at Deer Park, the land had had many uses. It was once a camp of some kind, and the old buildings had even been used as a police department shooting range. It's much more peaceful now. I have always loved the California "dryscape," the chaparral and scrub ecology that covers much of the state. It looks fabulous as a backdrop to mild touches of Asian design. Enjoy these images. against a crappy old pressboard bungalow. the foreground, dry hills beyond. (and heart) in that environment. compassion, in a natural setting. and a visiting laywoman eat watermelon. 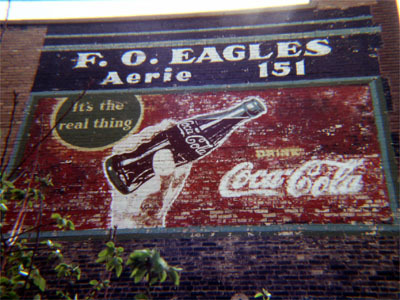 If you've never seen an old Coke sign painted on the side of a brick building, you've never traveled in small-town America. This one was on the side of the Fraternal Order of the Eagles building, Aerie 151, on B Street in Rock Springs,Wyoming, up the road (I-80) a piece from Green River in the southwest corner of the state. I was living near Salt Lake City with a lot of time on my hands, and a 1986 Chevy suburban. My job (tutoring an actor's son) required me to be on hand 2 hours in the evening, Sunday through Thursday. Days and weekends were free. So I roamed Utah quite a bit, and parts of adjoining states. The Suburban was a gas-guzzler, but I was glad to have it on this trip, as I hit a near-white-out blizzard. Rock Springs was my turn-around point (you can see a snow-smear on the lens), and the Wyoming Highway Patrol was shutting gates across I-80 behind me, all the way back to Green River, where I spent the night. I was blessed to spend great swathes of time in the American Southwest, including in the pueblos of New Mexico. This beauty was selling fry-bread (which is exactly what it sounds like) at Acoma"Sky City." I was there with a group of students on a trip I organized. Needless to say, fry-bread was consumed in mass quantities. Sky City dates back to the twelfth century (but I don't think this gal has been there quite that long). It sits atop a high mesa (flat-topped hill, mountain, or--in this case--rock) over 350 feet (100+ meters) high. It's considered to be one of the oldest continuously inhabited communities in what is now the United States. 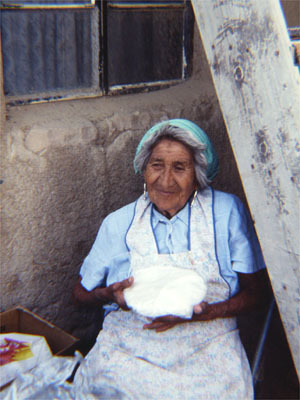 The people speak Keresan, a language they have in common with people in a handful of other pueblos, including Laguna, Cochiti, and Zia. The 1990 census showed only around 8,000 people speaking various dialects of the language. It's a linguistic isolate, meaning its descent from a root language is unclear. Perhaps it came with their ancestors when the emerged from the earth, as their origin myth states.